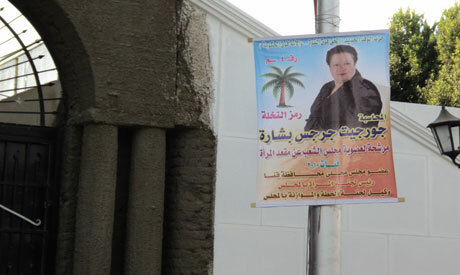 In the aftermath of the recent clashes directed at Egypt's minority Christian population over construction of a church, Coptic voters in Qena are sceptical about the parliamentary elections today. They say they are weary about the prospects for change, but won't be bullied by the recent violence to forgo their rights to vote. "The clashes between Muslims and Copts has no effect on relations between both sides," says Wafd candidate Jorget Gerges Beshara -- one of four Copts running in the governorate of Qena. "Here I am -- a Coptic candidate, yet depending on my Muslim neighbours, who I have strong ties with, to win the elections." In the Upper Egyptian city, where four Copts are running for election -- and whose 100,000 voters are 35 percent Copt -- the strain of whether to vote or not, and what would be the greatest statement in support of change, has been evident in recent weeks. Activists have been divided -- those calling for a boycott, those urging for the vote as the greatest symbol of a call for change, and those urging voters to stay off the streets and away from the lingering threat of violence. Hala Masry, a Coptic activist and fierce critic of the regime, called on the community to boycott the elections, calling them a "farse", and "cheap". She said the government needs to take bold measures to ensure that Copts feel they have equal rights -- a fair chance and voice -- and to ensure their safety as they head to the polls. Around the city, banners calling for unity adorn buildings and streets, apparently to positive reception. Despite the ardent calls to boycott of Masry and those like her, at the Qena election stations today, voters -- Muslim and Coptic -- began to show up. "I had asked copts not to cast ballots in such a hypertense and risky atmosphere," says Bishop Kirollos of the Naga Hammadi Diocese "Yet! With the improvement in security precautions inside election precincts, I asked them to go give their votes."